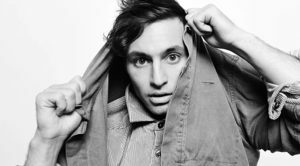 Formerly of Walk the Moon and Yellerkin, singer-songwriter Adrian Galvin now helms Yoke Lore, another indie rock project that features his brittle songs. His Far Shore EP recently garnered more than four million Spotify streams. Galvin, who owns his own dance company and choreographs a lot of his own videos, loves to rollerblade is obsessed with crewnecks. He also does the artwork for his albums. He recently released a remix of Goodpain featuring Yeasayer, Blackbird Blackbird, Blondage and Chad Valley. He recently spoke to us via phone from his New York home. I grew up in the woods of upstate New York. I was raised by two artists who were very dedicated to teaching their kids about art. We took dance classes and painting classes. We had Hebrew school at my house, and there were people singing the Shabbat prayers every week. On vacations, we would stop at the art museums in every city. It was part of our whole upbringing. Music became an outcropping of that. Did you start on a specific instrument? I started as a drummer. My older sister wanted to play drums. She was about 12. When I was 9, she was the coolest thing that ever walked the earth. I obviously also wanted to play drums. Six months later, she moved over to soccer or something, but I never moved away from it. How did you wind up working with Walk the Moon? When I was a freshman in college, they were seniors. Nick asked me once to sub for a gig that was that night. It was that night. They had a show in Cincinnati or Columbus or something. They taught me the songs on the way down in the car. I then co-wrote the songs on their first album. Talk about your first solo project, Yellerkin. That was my songs and it was with a producer friend of mine who had been at Berkeley and was more in the scene than I was. I was removed from the New York scene. It was the first time I got to really suss out my songs on a better production level. It was the first time I tried to get in the business. It wasn’t difficult. It was well received. I was lucky. We got a really nice manager and this intense player from London and we had a bunch of offers. It kind of fell apart in the midst of negotiating one of the offers. What approach did you take to the Far Shore EP? That album came out of the dissolution of Yellerkin. As Yellerkin fell apart, I had a week where I was wallowing in my sorrow. One of the labels that was going to do the American distribution hit me up and asked if I had any new music. I said, “No, but I could make some.” They told me to go do that and it became Far Shore. I love the illustration. What inspired it? When I draw like that, I just listen to the songs and just go. It’s a stream of consciousness drawing. “Heavy Love” is such an expansive song. Talk about it. I think I try to do that with this project in general. I want to capture the drama of a ballad but I don’t want to make it dramatic. It’s like, “How do you offer that level of emotionality without being cliché about it?” Having these sweeping vocals offered this emotionality but the hard-hitting drums helped keep the songs up and floating a little bit. Did you try to do something differently with the Goodpain EP? Not really. I just try to follow the line of the song or the motif of the song. I try to keep it honest, I guess. I have definite proclivities. I gravitate to the heavy vocals and textured drums and minimal synths. Did something in particular inspire the title track? I feel like my life is a practice of good pain. I have this perspective that you need to go through periods of struggle to illuminate the periods of grace. I think there was a bit of this project being my good pain. On a more specific level, I think being an artist and doing this is struggle . . . a big part of it is rejection and failure. It’s a big mistake if you don’t recognize the value in that failure. What should we expect from the live show? I just play with a drummer. I try to keep it controlled a little bit. It’s easier having fewer people, and it’s more focused. I think that because it’s a solo project, I want to keep as much of it me. I know that sounds super controlling. But it’s what this project is about for me. It’s about indulging in my instincts. How do you recreate the sonic density of the songs? It’s hard. People have laptops on stage and I really find that unattractive. I work hard with samples and loops and triggers to stay really involved in the playing of it. I also have enough elements, so it feels like a full experience.